Option of NTP, Sync-wired AFNOR/TBT clocks. Hour minute second, time or timer display. digital timer and digital time. 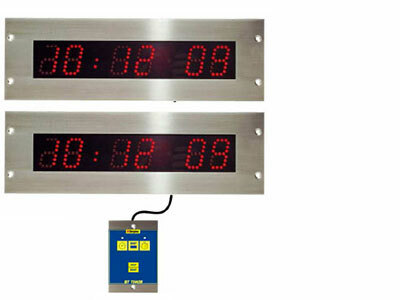 The Elapse timer is a Simplex 6700/6705 digital clock. It has a high-efficiency LED numeral display with digits measuring 2.5”. The clock is six (6) digits with Green LED. 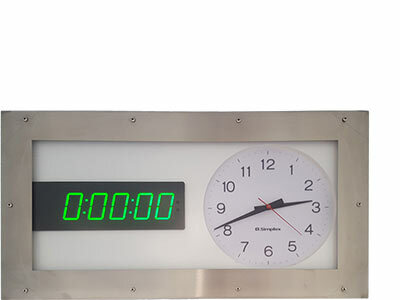 The clock has circuit components which allow it to interface with 6700-9502 timer control panel. The clock has four (4) levels of adjustable brightness. Digital elapse timer and Analogue clock to be installed inside a simplex PN#000-922 hermetically sealed case. Simplex Model 936211DT Theatre Timer is for use in hospital delivery rooms, operating rooms and laboratories. The 6311-12BK Analogue dual theatre timer is designed to be connected to a hospitals existing network.